The Ki-21-Ia is a Rank I Japanese medium bomber with a battle rating of 2.0 (AB) and 1.7 (RB/SB). It was introduced in Update 1.49 "Weapons of Victory". The Ki-21-Ia's role is a low-altitude medium bomber capable of destroying ground targets such as pillboxes and tanks. Although hindered by a low total bomb capacity, this aircraft is renowned for its impressive maneuverability. This being said, it is very easy for the Ki-49 to hover above an area and drop all of its payload rather quickly. The main targets of this bomber should be ground targets. The preferred naval targets of this plane should be destroyers and cargo ships, do not try to attack large vessels like carriers and battleships as your weak payload would not be strong enough to sink the vessel. With light turret armament, the Ki-21 is a plane that would probably perform it's role as a bomber best at higher altitudes. The different bomb layouts on the plane add a degree of versatility, with the 20 x 50-kilogram bombs allow the plane to take out a lot of ground targets effectively. Though, if the plane were dragged into higher rank matches the bomb load would be pretty ineffective against ground vehicles and wouldn't be very efficient against bases. For bases, naturally the best payload option would be the 2 x 500 kg bombs. 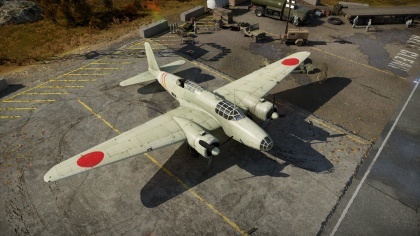 For an early-rank bomber, it does it's job well and though it lumbers through the air from time to time, it is much more maneuverable than the other Japanese equivalent at this rank, the H6K4. If attacked by fighters, it is important to remember and recognize the Ki-21's turning capabilities. 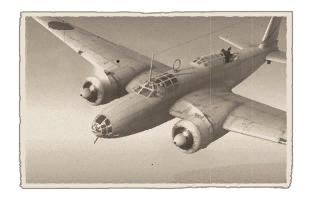 It is actually possible to win lateral turn fights against fighters with this aircraft as she is one of the most maneuverable bombers if not the most maneuverable bomber in game. While the Ki-21's defensive firepower isn't going to deter enemies from attack you, they still can damage enemy planes. This aircraft has the ability to hold up to 1000 kg of bombs in several different variations. 20 x 50 kg bombs, 10 x 100 kg, 4x 250 kg bombs, and 2 x 500 kg bomb. Use the 20 x 50 kg or 10 x 100 kg bombs to attack light tanks and light pillboxes. They are not viable against bigger targets, since direct hits are needed to destroy. This load out is particularly useful on maps have an abundance on non moving targets (light pillboxes) or lightly armoured targets (armoured cars or AA trucks for example). Use either of the 4 x 250 kg or 2 x 500 kg payload to destroy heavier targets such as medium tanks, pillboxes, destroyers, and cargo ships. Although unconventional, this aircraft is a fantastic weapon if you want to bait the enemy. Ideally, you would want to attract a higher flying enemy down to you and to get into a turn fight. This way, depending on the enemy aircraft you can out maneuver and distract him while teammates fly down to finish him off. The planes that you should avoid is any plane with cannons as this plane while it is durable does not like to take hits from cannon rounds. The plane that should be feared the most is the LaGG-3-34 which has the 37 mm cannon with the Air Target belts as 1 round from the 37 mm cannon will either cripple the Ki-21 or destroy it immediately. Being a bomber, speed is not necessarily an important attribute, however payload and defensive armament is. Upgrading the bombs allows for more target flexibility and damage potential while turret upgrades will help survivability. the turret belts and the "new turrets" upgrades are useful. The "new turrets" upgrade will allow you to fire the turrets for longer periods of time and having access to multiple ammunition belts is also helpful. The engine upgrades are also useful in that they will help you reach your target faster and will control engine temperature. Having all of the weapons upgrades will help drastically in unlocking the other modules on this aircraft. Getting the airframe module does help in survivability as it helps your plane's durability. In 1936, the Imperial Japanese Army Air Service issued a requirement for a new heavy bomber to replace two previous models. This new heavy bomber had to have a crew of four to six men, a top speed of 400 km/h (250 mph), had to be able to carry a bomb load greater than 750 kg (1,650 lb), had to be able to climb to altitude in less than 8 minutes, and had to take off in less than 300 m (980 ft). The new bomber also had to utilize Nakajima Ha-5 or Mitsubishi Ha-6 engines and had to contain specific models of radios, among many other specifications. These requirements were quite extensive and there weren't many heavy bombers in existence at the time that could perform at these standards. Mitsubishi produced two prototypes of the Ki-21 to meet these standards. This new design proved superior to the design submitted by Kawasaki but was nearly on-par with Nakajima's submission. In early tests, Nakajima's prototype, the Ki-19 had more reliable engines and a better bombing platform, while the Ki-21 had better overall performance. In later rounds of testing, after the Army Air Service ordered modifications to be made to both prototypes, the Ki-21 came out on top and won the Army's contract for a heavy bomber. Production began in November 1937 and the bomber began to see action in August 1938. The specific variant seen in game, the Ki-21-Ia, was used on the Chinese front during the Second Sino-Japanese War and against the Soviet Union during the Nomohan Incident. The Ki-21 would start off successfully during early World War 2, but by the end of World War 2 it was relegated to second line duties or kamikaze attacks. Overall 2,064 Mitsubishi Ki-21s of all variants were produced for the Japanese Army Air Force.